A spider web stitch (also called whipped spider web, ribbed wheel and a few other names) is an isolated embroidery stitch that creates a round shape. Though it's more solid than a true web, the spokes and lines do, in fact, resemble a spider web. This stitch works well as you embroider flowers and other round motifs. It would also be beautiful stitched at different sizes to fill an area or a silhouette. To work a spider web stitch, start with a group of straight stitches radiating from the center, similar to an eyelet stitch. The number of straight stitches can vary, depending on the size and look you desire. Bring the needle up near the center and slide it under the nearest spoke from right to left. Slide the needle under the same spoke as well as the next spoke to the left. This will create a wrap on the first spoke and have the needle in place as you repeat this process. Continue wrapping each spoke, working around the web and filling it in. Take care that you don't pull the wrapping too tightly or the stitch will look misshapen. When you reach the edge, bring the needle back down through the fabric under one of the spokes. These directions are right-handed, but you can reverse them if you are left-handed, working left to right. A basic spider web stitch will look like the photo above. This one has eight spokes, but you can work with more or less. If you are making one that is very large, more spokes will prevent snagging with the expanse of loose thread between spokes. The ribs that form where the spokes are wrapped also have the appearance of a wheel, so you might use this when stitching the middle of wheels. And to use this as a flower, simple add a stem or some leaves. 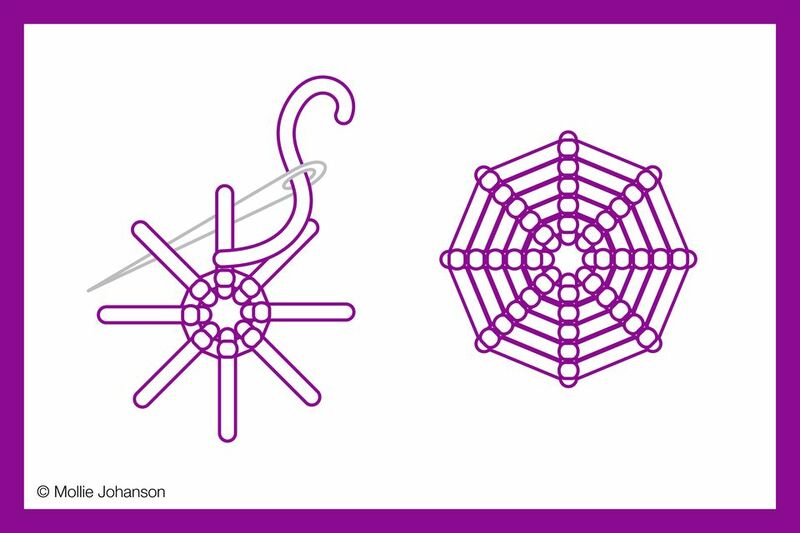 There are more than a few ways to customize and add variety to the spider web stitch. Use only four spokes to make a shape that's similar to a God's Eye. Stop the wrapping before you reach the outside of the spokes so they stick out like rays of a sun. Embroider with one color for the spokes and another for the wrapping. This is especially effective for when the spokes show. Use extended detached chain stitches for the spokes. This will leave little loops that show around the edges. Instead of making the spokes touch at the center, leave an open circle in the center. Wrap the spokes as usual, but instead of forming a solid circle, it makes a wreath. Try other variations as you go or see how you can use these ideas alongside each other to create a flower garden. This also makes a great companion to the woven wheel stitch, as one is more flat and the other has some thickness to it.